Are you considering straightening misaligned or crooked teeth? As we age, our teeth, crooked from childhood, may affect our confidence, oral health, and general wellbeing. While the options for teeth alignment are varied, the clear aligner revolutionised the dental industry in the late 1990s. This heralded a non-invasive dental treatment, in comparison to the more traditional metal or ceramic brace. We highly recommend a consultation to discuss the most suitable option for your circumstances; Invisalign or traditional braces? What is Invisalign? A transparent series of aligner trays that offer a gentle manipulation of the teeth into their desired position – Invisalign is fast becoming the treatment of choice for many adults and teens. An X-ray is performed to create an accurate 3D image in which to develop and configure the trays. A traditional method that features either metal or ceramic brackets, these brackets can be glued to the teeth and tied together via wires. The wires are then fixed onto each individual bracket with a minute rubber band. You can choose brackets that complement the colouring of your enamel, ensuring a more discreet appearance. In establishing the most suitable alignment solution, we recommend a consultation to discuss your situation and expectations with your dentist. 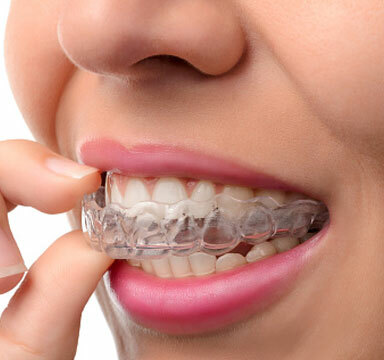 At all times, whether it be Invisalign or the more traditional brace, ensure to maintain a high level of oral hygiene to keep further issues at bay. Undecided? Consult with our team on the best teeth alignment treatment for you or your children. Book your appointment on (03) 9763 7333 today.